“The National Election will not bring any Change to this Tyrannical Rule and the Condition of the People – the Imminent Khilafah (Caliphate) is the Only Solution”- in this theme Hizb ut Tahrir is organizing various activities and as a part of that today (Monday, 26th November) after the Asr prayer, the party organized colorful “Khilafah Rally” at numerous important locations in Dhaka. 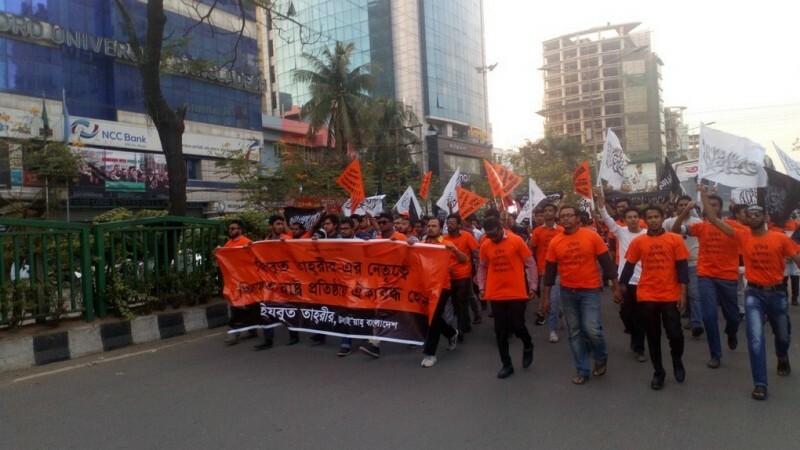 The title of each rally was “Unite under the Leadership of Hizb ut Tahrir to establish the Khilafah” and they marched on numerous roads of Dhaka city including Wari, Shapla Chattar, Shahbag, Dhanmondi, Gulshan, Uttara, etc. 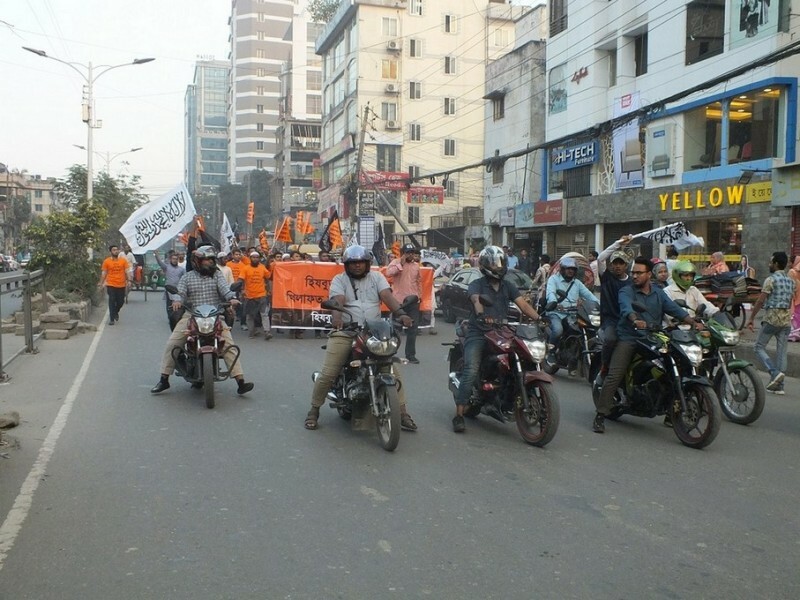 Participants were wearing orange T-shirts, raised the Shahada flags, and festoons of various statements, and additionally there were motorbikes marching with them and the chanting of the participants drew the attention from the all the surrounding people. With the chanting like-“Muktir ekpoth (Only solution) – Khilafah, Allah’r Ibadat (Way to Worship Allah) – Khilafah, RasulAllah’r Sunnat (Sunnah of RasulAllah) – Khilafah, Shahabader Oikyomot (Ijma of the Shahaba) – Khilafah”, distribution of leaflets and support of the general public, overally they made eye-catching displays. 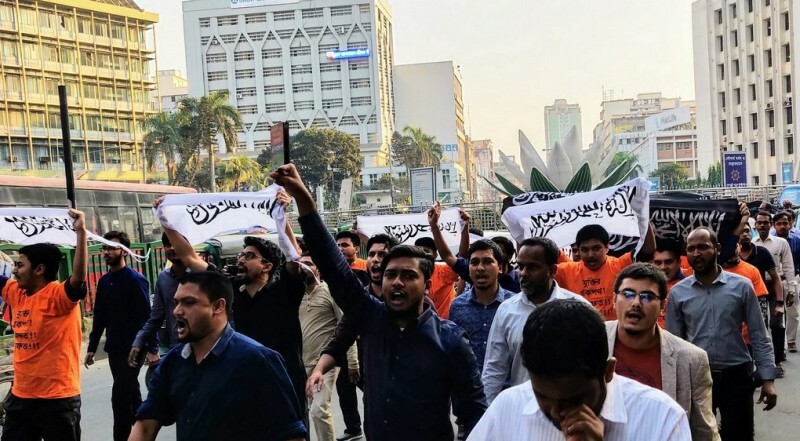 It is to be noted here that the Zalim government, fearing the ongoing activities of the Hizb ut Tahrir, is using its nefarious tactics of intimidation and deception. For over two weeks, through midnight raids at homes and daily raids in the offices, they picked up five activists, and then instead of producing them at court as is the due process, they kept them in unknown places all this time, and are now suddenly claiming that they arrested these activists yesterday (24th November). 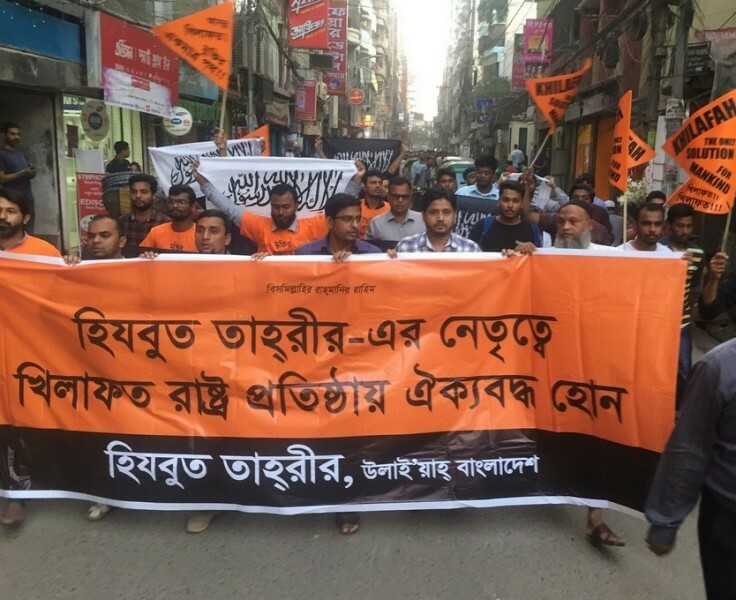 Basically, with the looming election, Hizb ut Tahrir as a true voice of this Ummah is exposing to the people the evil plots of imperialist USA-Britain-India and the deceitful false promises of their agents, the Awami-BNP ruling elites, and, is also presenting to the people how the imminent Khilafah will liberate the people of Bangladesh from this current miserable condition and transform us into a leading nation. 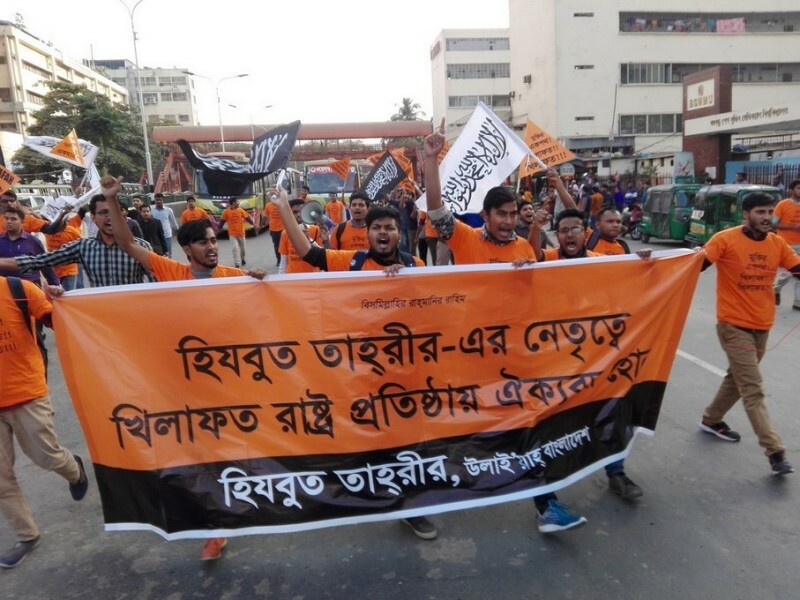 And for this purpose Hizb ut Tahrir has started campaign from October and is getting huge support from people, which has shaken the pillars of this regime and its so-called democratic ruling system. So, they have engaged in this type of shameless and evil activities against the advocates of the Deen of Allah (swt). But they should know that Hizb ut Tahrir is following the Sunnah of RasulAllah ﷺ to establish the Khilafah, so the regime will fail in the same way that the ruling class of the Quraish failed to stop the movement of RasulAllah ﷺ by their fear, lies and propaganda. And, by the will of Allah (swt), the Khilafah will be established very soon. The imminent Khilafah will liberate the people of this country from the clutch of this tyrannical rule and ensure the Sharia rule of justice, ensure the basic rights and security for every citizen regardless of their religion and race, control price hike and put an end to the exploitative income tax and VAT system. Mineral resources like gas-coal-oil are public property, and the Khilafah will cancel leasing treaties with local-foreign companies and utilize these for the benefit of the people, and cancel all investment treaties of foreign multinational companies that were signed to influence the economy of this country, such as, the transit, port, maritime boundary, etc. The Khilafah will establish war based heavy industries to ensure that our military is equipped with advanced weaponry. By unifying the Muslim lands, the Khilafah will bring together our people, resources and militaries and turn us into a leading nation in the world, and permanently put an end to the Kafir imperialist aggression over the Muslims.